Ever wonder how customs begin? We do! So we did a little research about the origins of sending Jewish New Year's cards. It turns out that the custom of sending Jewish New Year cards dates back hundreds of years - to as early as the 14th century - by the German-Jewish community! It was in the Book of Customs by Rabbi Jacob (son of a spiritual leader of German Jewry during the 14th century) that the custom of sending the blessing "May you be inscribed and sealed for a good year" was first mentioned. And here we are, in the 21st century, still carrying on this tradition today! Carrying on customs from generations past is something we value greatly here at More Than Paper. 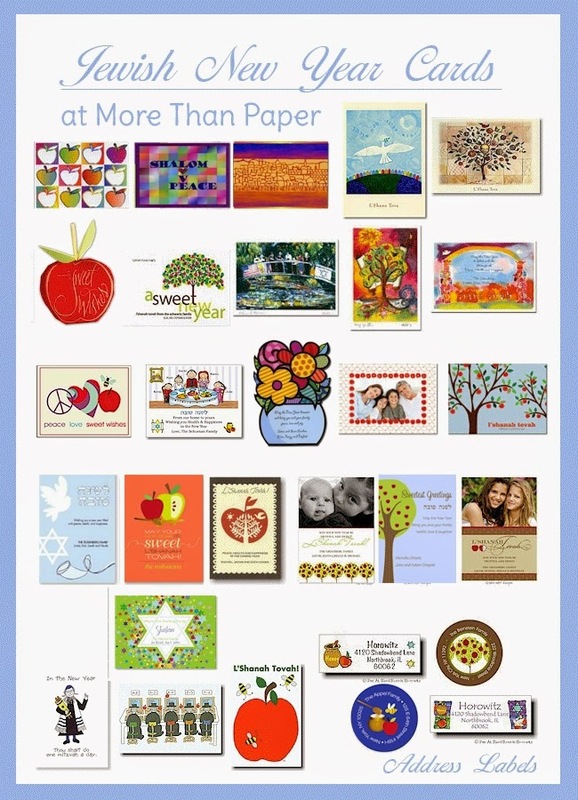 That is one of the reasons why we have the largest selection of Jewish New Year cards anywhere -- with thousands from which to choose! Leading up to and during the holiday of Rosh Hashanah, it is customary to greet family and friends with the Hebrew phrase "L'Shanah Tovah" (translated as "For a Good Year" or "May you have a good year"). This is why you will see so many cards in our store with this greeting as part of the cover design. The tradition of apples and honey, meant to symbolize the wish for a "sweet" new year is also evident on many cards. We have plenty of cards with the Shofar (Ram's horn), drawings of the Holy Land (Jerusalem), Star of David and many more symbols of Judaism. The ability to add a Hebrew phrase, such as "leshanah tova tikateivu vetechatemu," is available on many cards and translates to "May you be inscribed and sealed for a good year" - the phrase we see our ancestors were told to use on their greeting cards hundreds of years ago! For those who may not be familiar, the Jewish faith believes that a person's fate is decided during the High Holy Days - so with this phrase you are wishing for your loved ones to be "inscribed and sealed" in the Book of Life. Including this Hebrew phrase will not only send a nice wish for your friends and family, but will also uphold a time-honored tradition. Have you ordered your cards yet? Be sure to shop our huge selection here! Need help ordering? No worries! Give us a call at 516.466.1227 (8am-10pm ET) - we can help find one that's special to you, assist with greetings and wording, and ensure that you get cards you'll be proud to send to your friends and family. Head on over to shop now!